Apple on Wednesday took the wraps off its long-rumored tablet device, with CEO Steve Jobs showcasing the iPad during a product event in San Francisco. 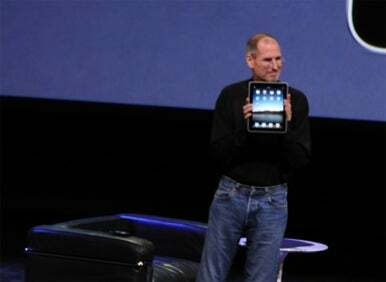 Steve Jobs shows off Apple’s iPad on Wednesday. Slated to arrive at the end of March, the iPad will start at $499 for a Wi-Fi-equipped 16GB model. Apple will also sell 32GB and 64GB versions of the iPad for $599 and $699, respectively. You’ll be able to add 3G connectivity to each of them for $130 more, with the 3G models arriving roughly a month after the iPad arrives in stores. A slate that looks much like a larger iPhone, the iPad features a home button, a MacBook-like aluminum bezel and a glass screen. It’s a half-inch thick, weighs 1.5 pounds, and has a 9.7-inch LCD screen (with 1024 by 768 resolution). It will use a custom-made 1GHz CPU and flash storage and, Jobs claimed, will get up to 10 straight hours of battery life or a month of life on standby. The iPad runs on a 1GHz Apple A4 chip. That’s an Apple-built processor resulting from the company’s April 2008 purchase of PA Semi, which specialized in low-power processors. For connectivity, in addition to the optional 3G, it has 802.11n, Wi-Fi, and Bluetooth 2.1; it syncs to a Mac via USB. To feed those 3G connections, Jobs also announced two new cellular data plans from AT&T: $14.99 a month for 250MB of data, $29.99 a month for unlimited data; both are prepaid, meaning neither requires a contract like the two-year commitment that iPhone users must make. Apple thinks the iPad fills the gap between phones and laptops by making it easier to browse through e-mail, photos, music, and videos. 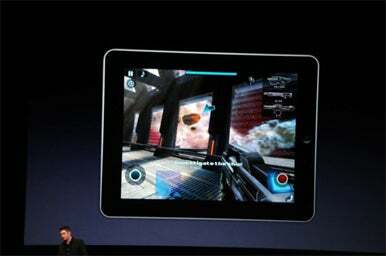 Apple also used demos Wednesday to showcase the iPad’s ability to display e-books and play games. Jobs spent parts of Wednesday’s demo seated in an armchair to show off the ease of using the tablet’s on screen controls. The interface seems a blend of what you’d see on a Mac and an iPhone, though it clearly draws its primary inspiration from Apple's iPhone OS, featuring the same home screen application launcher and dock, and many of the same built-in applications. There are some more Mac-like touches in some of the applications, such as the iPod program and the Photos application. The iPad features touch-screen controls and an on-screen keyboard (though an optional Keyboard Dock provides a full-size keyboard for when you’re charging the tablet). Unlike the iPhone, the iPad features panes, floating windows, and tabs—taking advantage of its larger screen space. But Jobs made a point of saying during his presentation that the more than 75 million people who have already bought an iPhone or iPod touch will be perfectly at home using the iPad's interface. As with the iPhone and iPod touch, videos on the iPad display in landscape mode and be switched between widescreen or fullscreen aspect ratios. The iPad includes a dozen apps that Apple says have been designed specifically for the tablet. Specifically, Apple senior vice president Phil Schiller showed off a new version of iWork that has been customized for the tablet. None of the three iWork apps will be on the iPad by default, however; you’ll have to pay $10 each for to download iPad-specific versions of Numbers, Pages, and Keynote from the App Store. Also included on the iPad is iBooks, a free application which will manage e-books on the tablet. While crediting Amazon for its pioneering efforts with the Kindle, Jobs announced that Apple was opening its own iBookstore where iPad users will be able to download electronic books from the likes of Penguin, Harper-Collins, Hachette, Simon & Schuster, and other publishers were already signed up to supply titles. Those titles will use the ePub format—an open e-book standard. Other apps featured on the iPad include a calendar, notepad, Web browser, photo viewer, separate music and video playing apps, and YouTube. Gameloft demos Nova, a game designed specifically for the iPad. The iPad will also run third-party software, in the form of mobile apps already available to iPod touch and iPhone users. Apple senior vice president Scott Forstall said that the tablet will run most of the existing 140,000 apps, which can run at their existing size surround by a bezel or doubled to run in full-screen mode. Demos during Wednesday’s presentation should even graphics-heavy performing admirably when run in full-screen mode on the iPad. Apple is also making a software development kit available to developers, to help create apps specifically for the new device. To demonstrate what vendors could do with those tools, Forstall introduced representatives from Gameloft, Electronic Arts, the New York Times, and MLB.com to show off iPad apps they’d already built. Updated at 10:44 a.m. PT with images and more iPad details. Updated at 11:30 a.m. PT to add pricing and availability. Updated at 1:46 p.m. with more detail throughout.